Soakwell installation in Perth. Polypropylene and Concrete. 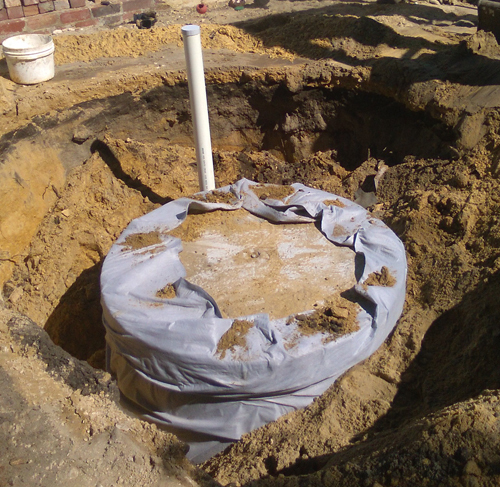 If you are building a new home or updating an existing house or patio, we will design and install a stormwater system to suit your individual requirements. Trafficable, modular polypropylene soakwells installed in rows. NOTE: Each product has advantages depending on the job but both are comparable in quality and strength. As a general rule of thumb once the catchment area reaches around 300m2 concrete soakwells become the most cost effective option, however access and available space also play a large part. For installation of polyproplene soakwells our 1t excavator is only 720mm wide! For concrete soakwells the excavator size ranges from 2m wide for the 3.5t / 5t to 2.5m wide for the 9t excavator. Tip! - When comparing quotes, make sure compaction is included to prevent sinking in the future. We also can provide spoil removal by Bobcat and truck if required. To calculate the left over sand take the volume displaced by the soakwells and add 35%. Email us your plans and using the correct formula we will determine your volume requirements and provide you with an online quote. Tip! - Try to include an estimate of the total roof area in m2 and stage of construction you are at in your quote request. If you plan on installing your own soakwells please visit the polypropylene soakwell calculator at www.soakwellcalculator.com.au or the Do It Yourself Soakwells™ website for more information. All About Soakwells is a Perth based Western Australian business that installs and supplies soakwells and stormwater products for new and established homes. 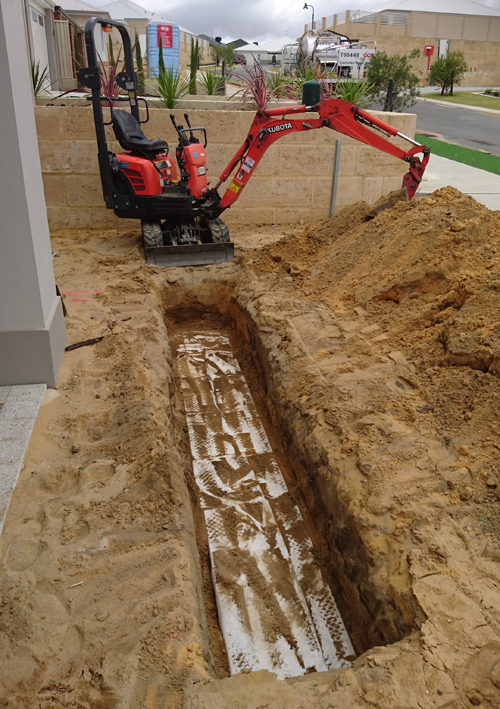 We also install drainage for units and driveways, pool backwash systems and spoon drains. All work is conducted to local council regulations and the building code of Australia. We do not recommend PVC soakwells in Perth as they are non trafficable, provide inadequete volume and are made obsolete by polypropylene soakwells. The number of soakwells required to meet council requirements for volume generally means that there is insuffcient space to maintain the required 1.5 - 1.8 metres from any boundary or footing down the sides of most properties.